A Vikings season ticket holder, she was in U.S. Bank Stadium in Minneapolis when the New Orleans Saints scored with 23 seconds left in the playoff game against the Vikings Jan. 14, putting the Vikings one point behind. “No one left the stadium for a half-hour after the game,” she said, noting that she attended the game with her husband, Doug, and two priest friends ­— Father Paul Treacy, pastor of Assumption in St. Paul, and Father Dan Haugan, pastor of Holy Spirit in St. Paul. “You had to high-five every person leaving the stadium,” she said. A former vice president and director of communications at Hormel in Austin, Craven, 60, drew on her marketing experience to capitalize on the game’s incredible final seconds. 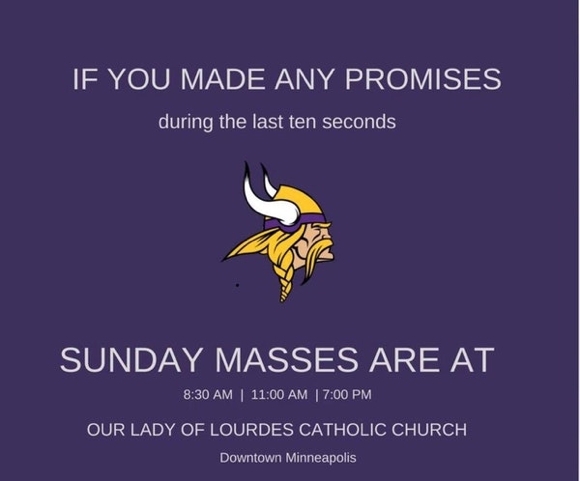 On a purple background with the Vikings’ logo, she typed: “If you made any promises during the last ten seconds, Sunday Masses are at 8:30 a.m., 11 am., 7 p.m., Our Lady of Lourdes, downtown Minneapolis.” She posted it to the parish’s Facebook, Instagram and Twitter accounts. Comments have been impressively positive, Craven said, noting that it’s easy on social media to attract people who express negativity when something is tied to the Church. But not in this case. “It was heartening that it was treated in a respectful tongue-in-cheek way,” she said. As a Wisconsin native, Father Griffith is a Green Bay Packer fan, but ahead of the Jan. 14 game, he joked with his congregation at the end of Mass that since friendship is willing the good of another, and it would be good for them if the Vikings won, that he wished the team well. As for the meme, “It’s been a lot of fun. It’s totally out of the blue. It’s very exciting,” he said. “Our community at Lourdes, we take the faith seriously, but we don’t take ourselves too seriously, and we like to have a good time,” he said. He noted that extraordinariness of the final play and the national hype around the Vikings’ potential to be the first NFL team to play in a Super Bowl in its own stadium created “a perfect mix of elements” for the post to go viral. Father Griffith said he hopes the post inspires Catholics who have been away from the Church to check out Our Lady of Lourdes or another Catholic church. “Maybe it’s a door that’s cracked open,” he said. The Catholic Cemeteries also created its own Vikings-related quip Jan. 18. “The only Eagles we want to see soar on Sunday are flying over the chapel mausoleum at Resurrection Cemetery,” with a photo of just that: an American Bald Eagle flying over Resurrection’s mausoleum. The Catholic Cemeteries oversees five Catholic cemeteries in the Twin Cities. The Vikings square off against the Philadelphia Eagles Jan. 21 in Philadelphia for the NFC championship.